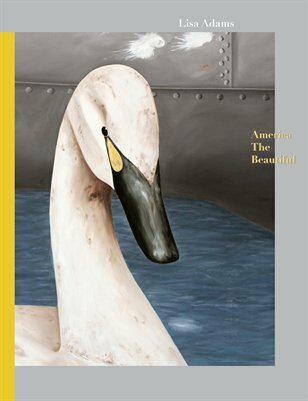 "America The Beautiful" was a 2015 exhibition by artist Lisa Adams at CB1 Gallery in downtown Los Angeles. This catalogue includes a redacted conversation between Lisa Adams and luminary artists Llyn Foulkes and The Dark Bob about the genesis of their authentic and iconoclastic art work. There are ten full-page reproductions of paintings from the exhibition and the catalogue is designed by renown graphic designer Jayme Odgers. Lisa Adams is a Los Angeles based artist with a B.A. in painting from Scripps College in Claremont, California and an M.F.A. from the Claremont Graduate University. Adams is the recipient of numerous awards including a Fulbright Professional Scholar Award, a Brody Arts Fund Fellowship and a Durfee ARC Grant. Her work has been exhibited nationally and internationally and is in the public collections of Eli Broad, the San Jose Museum of Art, and the Edward Albee Foundation. She has been an artist-in-residence in Slovenia, Finland, Japan, Holland and Costa Rica.